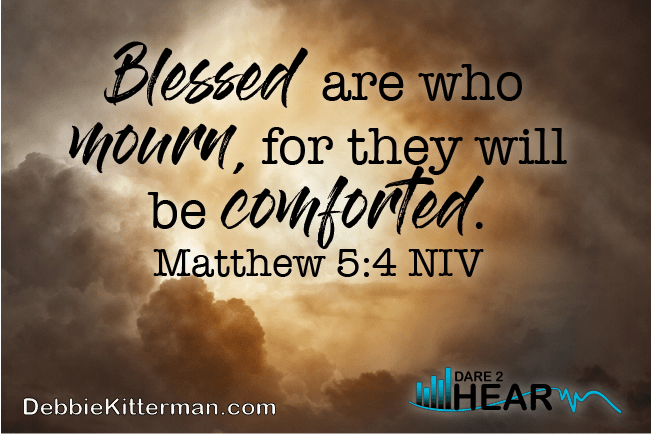 Welcome to week three of my series on The Beatitudes. The Sermon on the Mount teachings are a demonstration of what we should be living as Christ followers. Jesus set the tone early on in His ministry regarding what He was about and what it meant to be His disciple and have a Kingdom mindset. These teachings are the foundation for what Jesus modeled and would be doing for the next three years of His earthly ministry, and what He longs for us His followers to do as well. 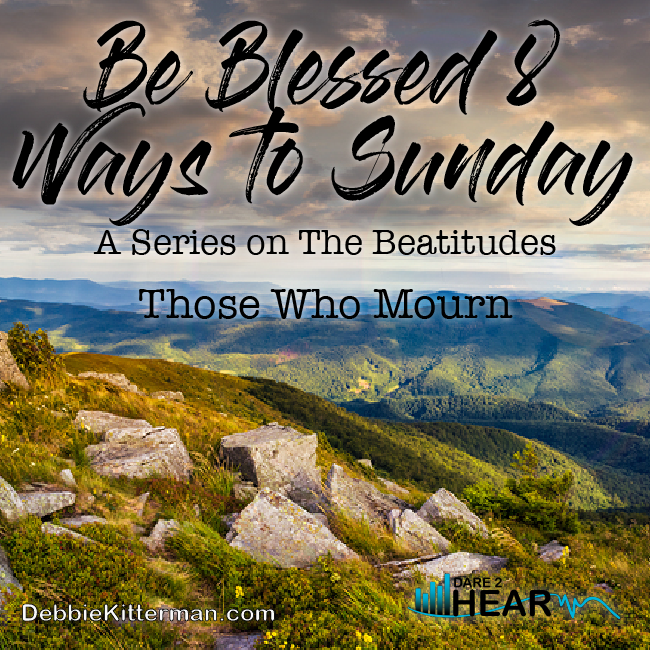 Join me for a New Series on #TheBeatitudes: #Blessed 8 Ways to Sunday. In case you missed the previous weeks, click on the pictures below. Blessed are those who mourn…. The very definition of someone who mourns means that they feel regret, sadness, or maybe even deep sorrow over the loss of something or someone. What is so happy or blessed about someone being deep in sorrow, feeling loss or having great regret or sadness? At first glance, this verse brings me comfort to know that when I am saddened by the loss of loved ones, or relationships, that as I mourn, God will comfort me. Even in the book of Revelation is says that God will wipe every tear from our eyes. But on a deeper level, Jesus was not just talking about our mourning over losing someone close to us either through death or a broken relationship. Jesus was also talking about us mourning over our own sinful nature. Take a minute to contemplate that …. Do we mourn over our own sin? Do we mourn over our sin? Do we mourn over the sins of others? This Godly sorrow comes when we see ourselves as we truly are apart from God, sinful and impure. Sorrow comes as we hold our life, the lives of others, and even the sins of our world up against the truth and light of God’s Word. This mourning or sorrow comes about when we understand and see how we fall short, and that we are in desperate need of a Savior – Jesus Christ. I think Rev. Billy Graham could have said yes to not just mourning over his sins, but the sins of others and even the world. He was an Evangelist through and through and he cared for the hurt and lost. I image he also wept and mourned for the thousands that did not repent at his crusades as much he cried tears of joy for those who did. As an evangelist, he looked through the lens of salvation and eternity and was driven by the need to take every opportunity, so people could understand and realize their desperate need of Jesus and His amazing, saving Grace. We desperately need #Jesus and His amazing, saving grace! All too often, I think it is easy for you and I to shrug off responsibility for mourning over the sins of our world and others. We can easily justify it by claiming we are not called to be evangelists, but the truth of the matter is, God has called us to evangelize or witness to those in our circle of influence as much as He called Billy Graham to evangelize the nations. We must remember, Jesus called His disciples to go and share the good news with all! He was placing upon them a responsibility to mourn not only for their own sins, but to do so for others as well. Through sharing the Beatitudes, Jesus reminds us (His disciples and us today) that we cannot seek happiness the way the world does. The Kingdom of God doesn’t work that way. True joy and happiness is not found in selfish ambition, excuses, self-justification, or a lack of repentance. True joy comes when we repent, surrender and take a posture of humility and service towards God and others. True #Joy comes when we repent, surrender and take a posture of humility & service towards #God & others. For a time, King David made excuses, had selfish ambition and self-justified his actions when it came to Bathsheba, and even killing her husband. However, after the Prophet Nathan exposed his sin of adultery with Bathsheba, King David modeled perfectly what it means for us to mourn over our sin. you, God, will not despise. (Psalm 51:17 NIV). We have a choice to make. When faced with the consequences of our sin and the suffering of living in a fallen world, we can either become cynical and harden our hearts or we can open our hearts by crying out to God for help and comfort. I choose to open my heart & cry out to #God for help & comfort. Many, when we are first saved, have a deep awareness of our sin, and so we mourn, repent, and rejoice, because God extends His grace and mercy while we are in this sinful state. Then as we call upon the name of Jesus, we receive the comfort which He promised us through His Holy Spirit. The Holy Spirit is to be our Comforter and friend, and He is there to comfort us in times of trouble and when we mourn. Oh God, make us aware and sorrowful not just over our own sins, but the sins of others and our world. God we desperately need You to send your Holy Spirit to comfort us as we mourn, and we turn our eyes heavenward to seek Your face. Help us to set aside any selfish ambition, pride, or excuses that may have kept us from receiving the fullness of your comfort and grace. Jesus, help us to have a humble and contrite spirit before You. We rejoice for the gift of Your forgiveness and Salvation. Oh how we need to remember to have a humble and contrite heart – this the Lord loves. Your post has me thinking about whether I mourn my sin? I know I’m forgiven, but sometimes I think it’s good to pause and realize what we’ve done, name it, repent, mourn, and then move on in grace and forgiveness. Yes, a humble & contrite spirit before the Lord is so important! Amen! Jennifer, yes, you are right, it is so important! There are so many things that we need to repent of, both for ourselves and for our world. Thanks for reminding us through this Beatitude that we need to mourn both individually and collectively. I’m loving this series, Debbie! Every day, Debbie…every day. Still, need a reminder. Thanks for the party! I think we all need reminders from time to time, myself included. Thanks for being here Jas. Thanks Marilyn – delicious goodies as usually. I am looking forward to checking them out, especially that avocado bake! I hope you’ve had a great week! Thanks for hosting! you’re welcome and you have a great one too! So very nice. Always need this reminder in my life. Thanks for speaking it. Thanks for hosting and I hope that you have a wonderful weekend. Our small group has been studying the Sermon on the Mount, which includes the Beatitudes! I bet it is a fun and insightful study Elizabeth. I love your insight on this! It is powerful and the prayer is one I will repeat this week as a reminder. Thank you so much for linking up with us at #LiveLifeWell. Debbie, this is so wonderful! I am loving this series! I have often wondered about this verse and knew that there must be a deeper meaning to it. I am so thankful that you explained it so well! I hate to admit that there are many times when I am not as sorrowful of my sins as I should be. I love the example that David sets for us! i find my deepest intimacy withGod with full blown repentance and mourning over my sin. thinki it happened this morning actually. (: always a little painful and always good. Debbie, this looks to be a great series! Today’s is a great reminder that we should mourn over our own sins and the sins of the world. The example of David mourning his sin in Psalm 51 is such a good one for us. Thanks for sharing with us at the #LMMLinkup. Blessings to you! Thanks Gayl for stopping in and leaving me a note and I have been enjoying writing this series. I am learning a lot as I have been researching for it.